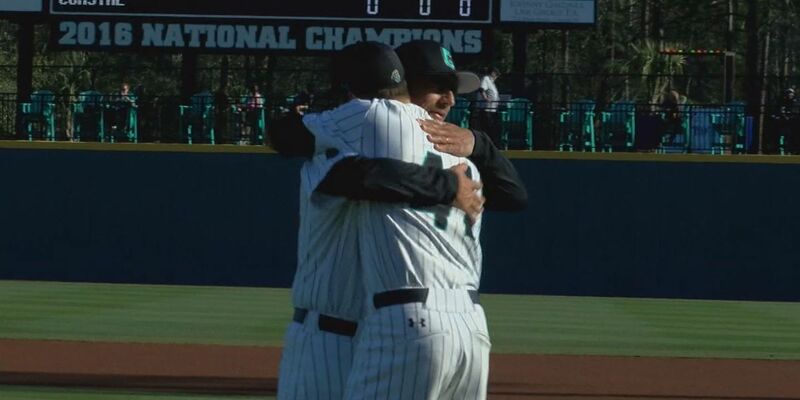 Prior to the game, members of the 2016 team unveiled the national championship trophy display and Coastal honored 2016 National Coach of the Year Gary Gilmore, who also threw out the first pitch. A standing-room-only crowd is expected for Saturday's game versus Western Carolina, which begins at 2 pm. Prior to the game, all the members of the 2016 team will be on hand to receive their championship rings as well as there being several video tributes and guest speakers. For Coastal against the Spiders, Kevin Woodall Jr. was 2-for-5 with a key home run, while newcomers Wood Myers and Cory Wood each had two RBI in the win. Alex Cunningham earned the win, allowing eight hits and four runs (two earned) with no walks and three strikeouts over five innings. Richmond threatened in the top of the second with consecutive singles to start the frame. However, Cunningham got a pair of strikeouts and a foul out to escape. In the home half, Coastal's Woodall smacked a leadoff double and moved to third on a Peyton Isaacson sacrifice bunt. Two batters later, Wood delivered a sacrifice fly to left field to bring home the game's first run for a 1-0 CCU lead. In the third, Coastal tacked on two runs to take a 3-0 lead. Leadoff batter Myers reached on a two-base error. Jordan Gore followed with a sacrifice bunt, but a throwing error on the play allowed Myers to score. Two batters later Isaacson lined an RBI single to center to plate Gore. Coastal manufactured a run in the fourth inning. Billy Cooke was hit by a pitch, stole second, advanced to third on a Matt Beaird sacrifice bunt and scored on a Myers' single to center. The Spiders took advantage of two errors and a three-run double in the fifth to tie the game at 4-4. R.J. Watters reached on a leadoff error and Vinny Capra followed with a bunt single. Richmond then loaded the bases on an error. Kyle Adams made it a one-run game with his double down the right field line. Jonathan De Marte followed with an RBI single to left field to tie the contest at 4-4. Coastal rallied with four runs of its own in the bottom of the fifth to take an 8-4 lead. Woodall immediately answered with a leadoff home run that just stayed fair down the left field line. Later, Dalton Ewing reached on an error and took second thanks to a second error on the play. Wood's first collegiate hit was an RBI double that scored Ewing and Wood later came around in a Cooke single. A Beaird single put runners on the corners and Cooke scored on a Myers' sac fly to left. Richmond scored once in the ninth and brought the tying run to the plate. D.J. Lee and Kyle Adams had consecutive infield singles to put runners on first and third. Lee scored on a wild pitch to provide the 8-5 final. After a single, the Spiders had two runners on base before Cole Schaefer struck out the final batter to secure the win. All-American Andrew Beckwith worked two scoreless innings in middle relief. He allowed one hit, no walks and struck out three. Lee and Daniel Brumbaugh each had two hits for Richmond. Starting pitcher Robbie Baker suffered the loss, allowing seven hits and seven runs (four earned). Coastal Carolina improves to 4-3 all-time versus Richmond, 29-13 in season openers since 1974 and 25-9 when playing its home opener. The Chanticleers also improve to 16-8 in season openers and 19-2 in home openers under Coach Gilmore, who began his tenure at CCU in 1996.